Also known as the American buffalo (although it isn’t related to the true buffalo). 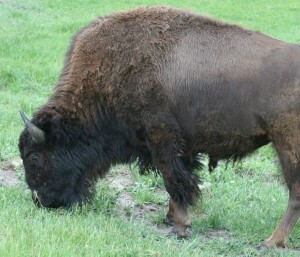 The bison’s main food is grass. The rutting, or mating, season lasts from June through September with peak activity in July and August. At this time, the older bulls rejoin the herd and fights often take place between bulls. They can move at speeds of up to thirty-five miles per hour and cover long distances at a lumbering gallop. Their most obvious weapons are the horns borne by both males and females. But their massive heads can be used as battering rams, effectively using the momentum produced by two thousand pounds moving at thirty miles per hour. At the time bison ran wild, they were rated second only to the Alaska brown bear as a potential killer, more dangerous than the grizzly bear. Wallowing is a common behavior of bison. A bison wallow is a shallow depression in the soil, either wet or dry. Bison roll in these depressions, covering themselves with mud or dust. Possible explanations suggested for wallowing behavior include grooming behavior associated with moulting, male-male interaction, social behavior for group cohesion, play behavior, relief from skin irritation due to biting insects, and thermoregulation. During the population bottleneck, American bison were interbred with domestic cattle. Accidental crossings were also known to occur. Generally male domestic bulls were crossed with buffalo cows producing offspring of which only the females were fertile.